Betta fish is one of the most beautiful fish with vibrant colors. As bright the color, is their nature aggressive. The name itself is derived from the ancient clan of warriors called “The Bettah” and thus it is a warrior fish. It comes from Southeast Asia and dwells in large rice paddy fields. Thus, it is adapted to still waters and gets depressed with higher current flows. Betta fish are very calm in behavior and do not swim all around but they live better and longer in an area with larger swimming probes. They get well only in bigger aquariums with lesser decorations. So, small tanks are not an option to put your Betta in. Betta is one of a kind for which you need to create a proper environment before you put it into the tank. Apart from the fish tank size there are a lot of small and simple yet necessary steps to be taken care of without which the fish may get seriously affected at times or even die earlier than it should. The first and most important part of the setup is the correct size of the fish tank. It follows a basic principle – The bigger the better. The minimal size of the fish tank needs to be of 2.5 gallons ( 10 litres ). 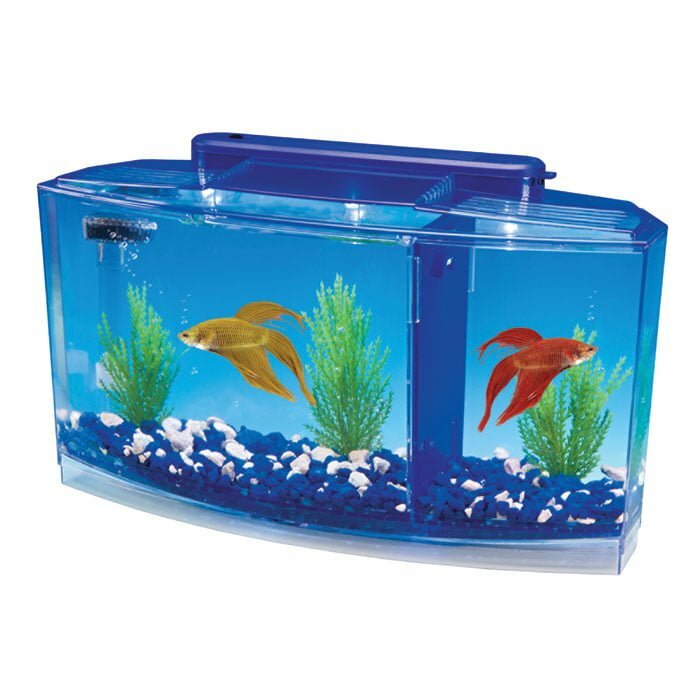 But optimum size of the fish tank for the fish to happy and of bigger size is 4 gallons. This fish’s origin is a rice paddy field and thus it can never thrive in a small tank or bowl. The knowledge of Betta fish breeding can be gathered right from its natural origin. Coming to selecting the types of tanks for your Betta, you have a huge variety from which you can choose. Because of this it often becomes difficult to select a category for the fish. The best option is the fish tank with installed dividers as Betta does not often get along with other fishes. Round bowls, bow front tanks, tanks with dividers, Zen looking tanks, advanced “bio” tanks are the ones you can opt for your Betta. Betta fish are tropical fishes and prefer a warm temperature for themselves. It has often been observed that in the colder waters they do not eat due to depression and quickly catch Betta fish diseases. Changes in the temperature are also not good for this fish. The optimum temperature for the Betta to thrive is 78.8F. Thus, even small heaters can be enough to keep the temperature good for them. But, rechecking the temperature every week is necessary as they get stressed easily with temperature fluctuations. Betta just like any other fish produces waste products which are harmful for its own health. There are many Betta fish types but all of them react the same. Nitrite is the main waste product and the most harmful toxin for a Betta fish. Thus, Nitrogen cycling needs to be done in the fish tank just before you place it in the tank. Weekly checkups need to be done too to keep a proper observation of the aquarium environment. Unlike other fishes, Betta gets stressed easily and affects its health if not kept in a suitable environment. It prefers clean waters with least amount of chlorine in it. The water needs to be of low currents and thus the filter blowers should not be of high power. It can live in average clean water but with a condition of low nitrite levels. It is mandatory that you never change the filter even if you are told to as the bacteria living in it are good for the fish’s health. Note: Betta has an enhanced ability of breathing direct oxygen from air and comes in the category of a Labyrinth fish. So, you get enough window for your aquarium to cleaned before your fish sulks. If you think about it any other fish in the aquarium is food and diet for the Betta as it is likely to kill any or die trying if it is not kept in its adequate environment. It has an upturned mouth and basically feeds itself from the surface of the water. The fact that it is a Labyrinth fish also explains the kind of food you need to feed it to. Dried bloodworms, brine shrimp or daphnia are the favourite food for Betta which also comes in combined amounts in commercial fish food products. So, buying any commercial fish pellet or Betta fish food is enough for the diet. Some say that Betta can live on the diet of the plant roots which is completely false. They require high protein foods with a minimum of 40% protein intake capacity and can not be relied upon plant roots or coral bacteria slugs. For your Betta to live happily the only accessory you need to provide is a proper area to swim around and show off its colors. The probability of the Betta to get involved in a fight or attack other fish is increased with decrease in the area for it to swim. Because of its tendency to fight, the aquatic caves and dark corners are good options for the fish to rest and hide at times. Making a coral base is good as the fish mostly sits on the lower surface without moving much. Otherwise, no other decorations need to be put in the tank. The Betta fish is a beautiful aquarium fish but comes along with some timely regulations and checkups. It gets depressed and aggressive easily. So, its companions in the aquarium should never be aggressive in nature or even more attractive than it is. Apart from all, it is adaptable to any fish food but with a 40% of worm protein is the best for it grow bigger and more colorful. So, love it with heart and take good care of it with and it will grow up to be a great aquarium friend of yours.